Preheat oven to 400°F. Place pepper, eggplant, tomatoes, onion and garlic cloves on a baking sheet. Brush veggies with olive oil. Season with salt and pepper. Roast until vegetables are tender and have brown spots, about 40 minutes ( time and temperate might vary according to your oven, so keep an eye on your veggies). Remove from the oven and scoop out the eggplant from its skin. Discard the skin and place the flesh in a heavy bottom large saucepan. Add the rest of your roasted vegetables to the saucepan. Add thyme, cayenne pepper and chicken broth to the saucepan. Bring to a boil. Reduce heat to simmer. Cook for about 45 minutes or until everything is tender and the broth is reduced. Let it cool. After it is cooled puree everything with a hand blender. Incorporate as much milk as you desire. Season soup with salt and pepper. If you are serving it right away, reheat soup. 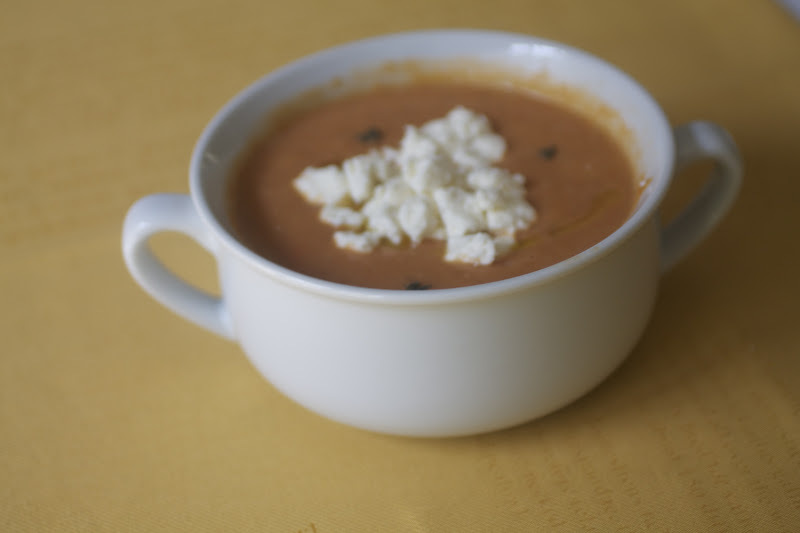 Ladle into bowls and top with feta cheese and a drizzle of olive oil. Enjoy! !